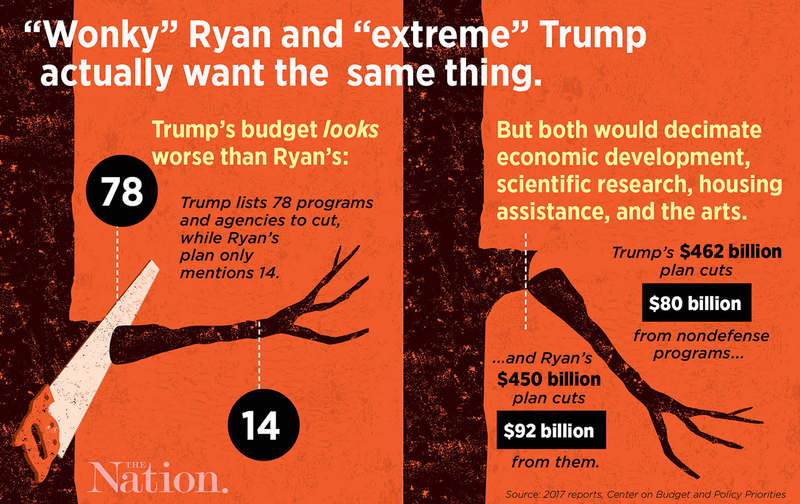 Ryan avoided naming the popular programs that both politicians would cut. Before President Trump’s budget proposal became public, rumors were flying that he would eliminate funding for the Corporation for Public Broadcasting, the National Endowment for the Arts, the Legal Services Corporation, and even the Manufacturing Extension Partnership—a benefit to small manufacturers that would seem in line with his commitment to save jobs in that sector. Trump’s preliminary budget confirmed the rumors, and more. Not only would all of the above be eliminated if he got his way, but 74 other programs are also called out by name for complete erasure. Trump’s proposed budget would be a catastrophe—and Paul Ryan has been pitching it for years. No funding for the arts. No funding for legal services for the poor. No funding for economic-development programs in Appalachia or the cleanup of the Chesapeake Bay. No funding for the US Institute of Peace or the Interagency Council on Homelessness. Not even the Community Development Block Grant, a funding stream popular with both Democrats and Republicans, would survive. It might sound like Trump’s budget would inflict unheard-of cruelty, but, in fact, House Speaker Paul Ryan has proposed—and many Republicans have backed—something nearly identical for the past six years. The only real difference between the plans is that Ryan’s is made palatable through its sly ambiguity. Trump’s, on the other hand, gets specific. First, let’s take a look at the numbers. In 2018, the first year of his budget cuts, Trump calls for $462 billion in spending on nondefense programs, a sharp contraction from the $542 billion they currently get. Ryan and the House Republicans aren’t too far from him. Ryan’s most recent budget calls for $450 billion in spending on this category in the first year his cuts would be in place. House Republicans, in the budget they voted on last year, wanted $460 billion. Ryan and his fellow House Republicans did single out some programs for elimination. Ryan, for example, wants to end spending on the Clean Technology and Strategic Climate funds, the Corporation for Travel Promotion, and the Wool Apparel Manufacturers Trust Fund, among a handful of others. Many of these are worthy government initiatives. But the number isn’t quite as staggering as the 78 programs that Trump targets for elimination, nor do they have the brand-name recognition of Meals on Wheels or NPR. Ryan has generally aimed for the same results with less controversy by calling for a $160 billion reduction in the broad category of nondefense discretionary spending, while mostly failing to specify what would be affected. Vital programs, from Head Start to law enforcement to scientific research to rent and heating assistance for the poor, all fall under this label. Almost certainly, they would feel the pain of Ryan’s deep cuts. But Ryan doesn’t have to name them in this preliminary stage, and he cleverly chose not to. The other way Ryan aims to slash spending while dodging blame is by turning programs like Medicaid and food stamps into block grants. Changing a program to a block grant means that the federal government gives states a fixed amount of money and tells them to figure out how to keep the services going. This lets the federal government off the hook when it comes to sharing the burden of any rising needs and costs. History shows that the value of block grants erodes over time, often quite significantly, thanks to inflation and population growth, amounting to deep cuts by another name. The federal government spends less, and states are left holding the bag—while congressmen like Ryan get away scot-free. Ryan found other ways to threaten programs without tying himself to their demise. His budget included plenty of calls to eliminate “duplicative” programs. He argued that Congress should “eliminate abuse” in the Low Income Home Energy Assistance Program, which gives money to the poor so they don’t freeze to death. Where Trump says he would just get rid of the whole thing, Ryan’s approach avoids sounding cruel while still posing a serious threat to the program. Paul Ryan was able to build a reputation as a serious policy wonk based on budgets that avoided details and therefore responsibility for the pain they would cause. Trump just erred by making the subtext text.